We utilize a select team of people in our various manufacturing processes, both in Peru and abroad, who share our vision of exceeding each customer’s expectations. We now welcome you to a world of great opportunities. Topitop unites all the processes that a buyer may require from a manufacturer in a full service package, from production through to shipping the end product to retailers. At a time when many industries are opting for specialization, Topitop focuses its processes based on “full package” logic, thus making efficiency gains in many areas and adding value to the brands it manages. This is a key element of the company’s strategy as an innovative process that ensures collective control of the entire chain, allowing us to meet the demands of the most competitive markets in terms of quality, price and delivery. Our satisfaction of foreign and national customers is such that we are endorsed by reliable, quality big brands such as Gap, Abercrombie, Hugo Boss, and Under Armour, among others. 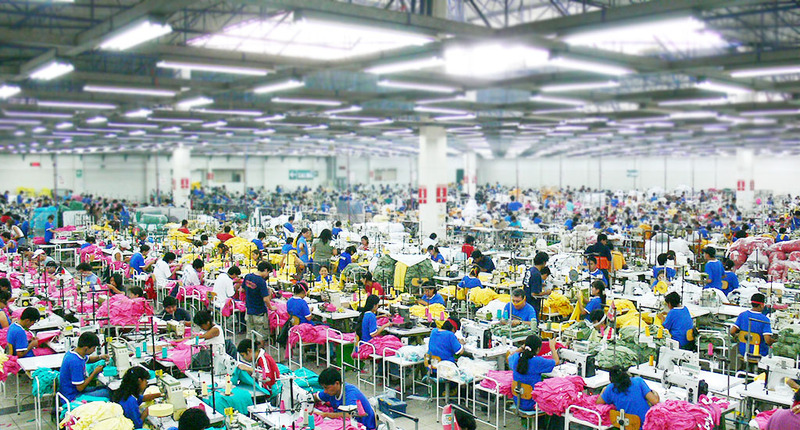 We now manufacture over two million garments for export every month. success in achieving its goals. To maintain sustainable growth over time, we have an ongoing training program that keeps our staff up to speed and in tune with required production levels. which is run by highly trained professionals who give results with optimum efficiency and accuracy. We can provide all kinds of embroidery techniques, such as embroidery applied with felt, embroidery on prints, lurex embroidery, burmilana, and hand embroidery. We utilize Melco, Tajima, and Amaya brand computerized machines that allow us to mass produce with maximum efficiency and quality. Our staff is thoroughly trained in the administration and maintenance of this equipment, resulting in high production and optimum quality at competitive prices. specifications and ensuring the manufacture of top quality clothing. Topitop trusts in its control parameters to make year-on-year forecasts to experience the growth that enables the company to compete in the international market with lower costs and better processes. reproducibility of the requested items, all by allying our staff’s professionalism with advanced technology. This area is the crucial end-point of the manufacturing process. Here, we ensure that 100% finished garments result, with zero margins for error. Each garment passes through the tagging, steaming, folding, bagging, and boxing processes, culminating in a rigorous final quality control before being delivered to our customers. Our staff is trained in the effective and efficient management of each process to ensure total compliance with the production times set for all projects. providing the benefits that come from getting good quality products at competitive prices. What’s more, Topitop’s specialists are well positioned to guide customers around the latest market trends.